Immediately following a suicide, accident, criminal act or other traumatic event, large amounts of blood may be present. If this blood is not cleaned up immediately, the blood will begin to spread and will be absorbed by porous materials, such as: concrete, asphalt, drywall, carpet, sub floor, grout, studs and floor joists. 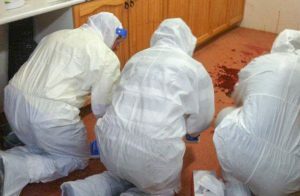 To help prevent unnecessary contamination and increased structural damage, it is imperative that you contact a company trained in blood cleanup as quickly as possible.